The duration may be fixed arbitrarily in minutes and seconds, etc., or it may be determined by allowing the number of cards (see below) chosen by the players to work out the length ad lib. a. Cut along the lines dividing the page; this will produce a group of small cards, to be mixed up in any order. 2. groups of 2 or 3 notes to be repeated several times. 1. notes are at concert pitch (treble clef). (average quarter = 60 = extremes of either tempo range are to be avoided). 3. dynamics may be p-f (extremes: pp-ff or special effects such as sudden crescendo, fp, etc., are to be avoided. 1. sustained notes are held the length of one breath or about 20-30 seconds. 2. repetitive groups are to be played, alternately, 6,11,14, or 20 times (that is, the performer may begin with any sequence but should use up all 4 possibilities before he returns to the first). NB After each card is played, the performer must change his physical position, that is, move to another part of the performance area. These movements should be as expeditious and quiet as possible, and the only time during the performance when the performer is to be silent (except, of course, rests which are part of the groups). Movement among, behind, to the side of, or over the audience, if any is acceptable. "Theatrical" actions not necessary to the performance of the piece are to be avoided. *The number of cards may be increased to any number necessary for performance; this may be done in any number of ways, obtaining additional copies, duplicating this copy, or copying the groups by hand. Copyright (c) 1961 by Joseph Byrd, reproduced here by kind permission of the composer. Joseph Byrd is one of the key figures in the radical music, and was active on both coasts, as a student of Barney Childs in Arizona, at Stanford in the Bay Area, later in New York, where his activities included membership in the Fluxus movement, and then in Southern California, where he began a deep study of American traditional music and eventually became well known for the albums The United States of America and The American Metaphysical Circus. He was also active in film scoring and arranged and produced Ry Cooder's album Jazz. Today, Mr. Byrd lives in Northern California where he teaches music at the College of the Redwoods. FISH: A Ballet for Woodwinds contains a number of features shared with other contemporary and near-contemporary works in the radical repertoire. Among these are the repetition of small groups of tones and a resulting static harmony (on the basis of these two features, FISH could be thought of as an In D, albeit in a D that is ambiguously posed at once in major and minor as it is composed only of the tones d', f', f#', a', c'', & c#'' (i.e. overlaying major, minor, dominant seventh, minor seventh and major seventh chords; the distribution of pitches among the individual groups is done with a rigor that approaches serial styles of the day but does not insist upon complete aggregates, a broken serialism, if you will), an overall slow pace allowing listeners to "get inside" sounds (Young's formulation), a relatively open instrumentation, and a form that is mobile with regard to the sequence of local patterns yet globally ergodic. As well, it includes a theatrical and spatial element — it is literally a ballet for woodwinds — that resonates with work both in the Bay Area and in the nascent Fluxus activities. If there is anyone reading who goes anywhere near the UCBerkeley Music Library and could help me out with a score there, I'd be much obliged. Email me (follow the link to my webpage on the right). If all goes well, in the next month or so, there will be a small series of notes on form (on figures in a clearing, a long march along the long line, & late Cage and primitive form), perhaps another item or two on rhythm in the series of Temporary Notes, two additions to an item about the radical music called The Raw & the Cooked (these two items are, of course, From Honey to Ashes and The Origin of Table Manners), and perhaps an item about thirty-some years of working with just intonation. I figure that if I can get these things done, I can safely rest on my laurels & devote the rest my days to croquet and dim sum. On the other hand, I always take requests: if you put enough dimes in the hat & hum a few bars, I can probably fake it. The Well-Tempered Blog reports that Liberace's first Palm Springs house is on the market. Not the sort 0f thing I usually remark upon here, but my brothers & I went actually went trick-or-treating to that house when we lived in Palm Springs, probably the Halloween of '68. I don't remember how much candy— if any— we got*, or who answered the door — if anyone. I think that the front landscaping was less green and more desert-like back then, but the circular driveway and the chandeliers are just as remembered. I wonder if this was the house with the grand piano-shaped swimming pool? * The supposedly miserly Jack Benny was famously generous at Halloween. The composer Paul A. Epstein was, as a student, near the center of the storm which I have here called the radical music. As a graduate student at UC Berkeley, he was a member of a composition seminar that included La Monte Young and Terry Riley, which was, in turn, part of a very lively scene in the San Francisco Bay Area. More information about Epstein and his elegant music is available at his website, here. DJW: Could you briefly describe your musical background and orientation prior to your study at Berkeley? How would you have then described your own musical style and what repertoire attracted you the most? PAE: I grew up in Boston. My mother taught piano and made a valiant attempt to teach me. After four years (I was eight) we agreed it was hopeless, and I switched to clarinet. My earliest memories include my mother practicing Chopin and Met opera broadcasts on Saturdays. Boston was anything but a hotbed of new music in those days, but we had good classical radio, and the BSO occasionally did one of the safer 20th century works. The first modern composers that made strong impressions on me were Copland and Stravinsky. I can't remember hearing a piece of 12-tone music before college. I started to think about composing somewhere around my senior year in high school. If I had started then I probably would have wanted to sound like the Copland of the Clarinet Concerto or the Stravinsky of L'Histoire du Soldat. I actually started writing in college and found that I wasn't very good at imitating specific styles, so I pretty much had to find my own way. At some point I decided to try 12-tone, but with very little theoretical knowledge prior to Berkeley. DJW: What drew you to study at Berkeley? Which composers on the faculty did you work with? Did you always see eye-to-eye with your teachers on musical matters? Were there other graduate students with whom you had useful exchanges? PAE: I don’t remember specifically what drew me to Berkeley. The Bay Area looked like an attractive change of scene, and the department had a strong reputation, though in large part for its historians like Lowinski and Kerman. And it was a liberal arts program, which is what I was used to. In those days we liberal arts types looked with scorn at conservatory-style programs. In the three years that I was at Berkeley the composition seminar was taught by William Denny, Joaquin Nin-Culmell, and Seymour Shifrin. I remember Bill Denny as an accomplished orchestrator, soft-spoken, with a gentle sense of humor. Neither he nor Nin-Culmell tried to steer us in any particular stylistic direction, which was just as well given the makeup of the class. I was most stimulated by what La Monte Young and Terry Riley were doing, which at various times involved extremely sparse, post-Webernian textures, improvisation, noise-based material sometimes verging on happenings, and La Monte’s conceptual pieces. Among the performances that La Monte organized was Cage’s Imaginary Landscapes No. 4 for 12 radios which I had the pleasure of participating in. I wasn’t yet prepared to go in the direction of La Monte and Terry’s more radical work, but it left its mark and I think informed much of what I did during the 60s and early 70s. Terry had a more immediate impact on my work. He introduced me to the poet and film-maker James Broughton, who generously allowed me to set three groups of his poems. The first became a piece for reader and instruments that the members of the composition seminar performed at the annual Student Composers Conference with La Monte as reader. The laisser-faire approach of Denny and Nin-Culmell vanished abruptly when Seymour Shifrin took over the Seminar. Shifrin was a brilliant musician who insisted that we know where every note came from and was going. That worked well for some, less well for others. Typical of the kind of tensions that occasionally arose was the time we found out that Merce Cunningham’s company was to perform on campus and that Cage would be with him. When we suggested to Shifrin that we’d like to invite Cage to speak to the Seminar, he went ballistic. Cage was not a real composer, and there was no way he would be allowed into Shifrin’s classroom. On the other hand, Shifrin taught a seminar entirely devoted to Moses und Aron that was a highlight of my time at Berkeley. Seymour was an extraordinary man. As much as he questioned our ideas, and as fiercely as he defended his own, he always treated us as colleagues. The most important class for me outside of composition was David Lewin’s Webern seminar. The analytical skills I picked up there carried over directly into my 12-tone writing but also influenced my minimalist work in subtle ways. In my last year at Berkeley, I was able to audit Berio’s composition seminar at Mills College. I spent the following year studying with him in Milan. DJW: Did you have contact with Robert Erickson or any of his students, or others who went on to found the San Francisco Tape Music Center? PAE: I didn’t get into electronic music until I got to Tulane in 1963, so I really wasn’t involved with the Tape Music Center. I never met Erickson. I met Pauline Oliveros out there, but I didn’t get to know her until much later. DJW: You made a distinction between your own twelve-tone and experimental works. For several composers, beginning probably with La Monte Young, features of a radical and minimal style, including very long tones, increased use of repetition, and isolation of groups of tones that suggested, if fragmentarily, tonality, emerged in the context of twelve-tone or free atonal scores. So it appear to have been more complicated than a simple opposition between twelve-tone and experimental music. How did this distinction play out in your own music? PAE: A very interesting question. I’m afraid I can only address it in a rather convoluted way. After spending a year in Milan, I wrote one instrumental piece - 12-tone and strongly influenced by Berio - after which I found that that approach no longer worked for me. For the next few years I did electronic music, first at the Tulane studio started by Otto Henry; for one summer at Alvin Lucier’s Brandeis studio; and later at Temple University, where I made several pieces for live performance on the Moog synthesizer. I would characterize this work as experimental in that it proceeded from the capabilities and limitations of the available equipment rather from a clearly envisioned objective. While at Tulane, director Richard Schechner, painter/designer Franklin Adams, and I started The New Orleans Group to do collaborative work in intermedia. This work began with a large-scale Happening-like piece and culminated in an environmental staging of Ionesco’s Victims of Duty. Schechner moved to New York in 1968, where he started The Performance Group, and a year later I moved to Philadelphia. That summer I began working with The Performance Group on their environmental staging of Macbeth. With TPG, Schechner, following Jerzy Grotowski’s model, had put aside all extraneous media, including incidental music, to focus on the performer. My role was to develop musical material with the actors, most of whom had strong voices but limited musical training. While we were able to use some strictly notated material, much of the music involved improvisation. With the actors I developed a set of exercises, derived in part from the vocal work they were already doing, that served as a basis for much of this music. After working on several productions I developed a piece with five members of the group, Concert for TPG, that involved scored as well as semi-improvisational sections. In the mid-70s I began to work with the Philadelphia-based dance group, Zero Moving, adapting much of the work I had done with actors. At the same time I found my way back into instrumental music, and here’s where we re-connect with Berkeley. I was working on a piece for voices with text fragments by Gertrude Stein. (It would eventually become a dance piece, Four Movements for Moving Voices Moving, with all the vocal work done by the dancers of Zero Moving.) Most of the piece was semi-improvisational, using the full speech-to-song spectrum. When I got to the final section, that all changed. The text, appropriately, had to do with repetition. I found myself writing a simple diatonic melody proceeding in repeating canonic fragments. The process was similar to that of In C, which I had heard for the first time, belatedly, shortly before. I had loved the piece but had no idea that it was anything I wanted to emulate. So the Stein piece was a kind of conversion experience, and it determined my musical progress from that point on. Since then my music has continued to involve an exploration of melodic pattern. In C was a major catalyst, and the work of another acquaintance from my Bay Area days, Steve Reich, was another crucial resource. Although my break with dodecaphonic music was complete, I’ve come to understand that minimalism involves some of the same tools and mind-sets. In fact I would describe much of my music as diatonic serialism. DJW: Could you describe the music you're working on now? What elements of continuity with your earlier interests are present? Are there any new directions that interest you in particular? PAE: For the past few years I’ve been working with rhythmic cycles that are prime to one another as a way of greatly increasing the period of repetition. I’m trying to retain something of the rigor, system, and economy of means of early minimalism while reducing surface repetition. Most recently I did a piece for flute, bassoon and piano that used 12 cycles of 3 to 37 16th-notes (all the prime numbers plus 4.) Recently I was startled to realize that there was a direct connection to the Moog pieces I did around 1970, where I modulated a tone with several slow waves that were out of phase with one another. In both cases short repeating cycles combine to create an apparently non-repeating resultant melody. My music remains largely, though not exclusively, diatonic. And most pieces now include changes, even frequent changes, in the pitch collection. In two recent pieces I paid tribute to Terry Riley and Steve Reich, whose music continues to be a source of pleasure and inspiration. The second movement of my AlgoRhythms 2 is entitled “At C” and dedicated to Terry. And one of my set of piano pieces, Interleavings, is dedicated to Steve. Entitled “ParaPhase,” it alternates notes of the Piano Phase and Violin Phase patterns. Finally, another continuity with my early work is an involvement with text. I’ve had a long-standing collaboration with the poet and novelist Toby Olson that has thus far produced two chamber operas and a half dozen sets of songs and chamber vocal pieces. Why is the Democratic Party Convention so hard to watch? Despite my total sympathy for the project of changing regimes in Washington, try-as-I-might to watch the convention, whether on C-SPAN or CNN, even as background noise to an insomniac composer's busy work, I had to give up. The organizers had failed to create an engaging stream of television and I believe that this failure is due to some basic compositional errors. Yes, compositional, as in music. Because music is, first, a temporal art and skill in music is skill in filling time in a way that commands, or at least, provokes, attention. There are a few basic strategies for doing this: trying to sustain a long line which, a narrative, with very economical distribution of material, or, alternatively, making sharp tactical cuts between material before anyone is aware they might be bored. In either case, the whole is shaped so that all times the listener is waiting for more, with both local global high points in interest or tension. To be fair, the managers of the convention have some problems with their material, in that the convention is really a done deal with little dramatic tension to offer. Hillary Clinton's speech already done and no surprises due in the traditional roll call vote. Further there is the problem of trying to make a show that functions simultaneously in two formats, one on the floor of a large convention hall, where the audience is captive but obviously so restless with lack of sport or spectacle, that letting a Zamboni out onto the convention floor between major speeches would have been more effective than the canned music, campaign and videos, and the awful "up close and personal" video bios. I'd really rather have some substantial power point presentations on policy than that stuff. Worse, however, is the network TV coverage, in which, absent a compelling narrative on stage in the hall, the individual news teams have substituted the narrative of "who's the next talking head?" in the broadcast booth. I'd prefer a Zamboni there, too. (The famous 1968 Democratic convention, for all its faults as politics, was terrific television, and the networks then used the contrapuntal possibilities of activity outside and in the hall itself, between the podium, the delegations, and the booths, to best advantage. The coverage also had compelling pacing, able to sustain attention long into the night, the result, however unintentional, of striking long-scale harmonic rhythm. The 1972 convention, in which candidate McGovern's speech was delayed until the wee hours of the morning, was an example of harmonic rhythm gone far wrong, with the little tension left at that point insufficient to command an audienceand the effect on McGovern's campaign was negative). So the bad news for the Democrats is that their composition skills look bad; the good news is that the Republicans, who have had no tension in a convention in memory, are usually much worse. John Cage disliked the word "texture" when applied to music; he thought that use of the term was an appropriation from a physically tactile domain that made no sense in the description of music. And while one could argue with Cage on the somewhat peripheral case that some sounds exert a presence which actually is tactile, sounds that one can feel through the skin as well as hear with ears, Cage's critique stands, usefully, pointing to a convention which is, indeed, vague. "Texture" is, in talk about music, used for a number of things, including — rather vaguely — the density or level of activity, and — more precisely — the quantitative and qualitative state of ensembles. In fact, our vocabulary for describing ensembles is quite good; it is both clear and vivid. Unfortunately, we've acquired some habits with this vocabulary which are not so good. I recently volunteered to help a Gymnasium student prepare for a music exam. I managed to get him into real trouble, and it was trouble with a capital "T" and that stands for Texture. You see, on the exam he was being asked to reproduce a certain narrative in which "music history" (unqualified by many particulars of where or when) began with monophony, in the form of chant and monodic song, got mucked about by some non-westerners into heterophony, which was busy but not so sophisticated as that which followed in the West, albeit in a now-quaint and antiquarian way, as polyphony, and the story of textures ends with all of us singing Lutheran chorales, which are identified as homophony. All the sins of this narrative — and it happens to be a standard entry-level academic narrative on both sides of the pond — aside, the sin that immediately alarmed me and led me to getting the kid in trouble was the fact that he was being forced to abuse some perfectly good terminology. These terms are useful for describing ensembles, but they are not really a set of four distinct terms but two very different pairs of terms. The first pair, monophonic/polyphonic is quantitative, a simple binary opposition between a single voice or line and and an ensemble of more than one voice. One may well go on to further distinguish polyphonic ensembles in terms of the numbers of lines, but the basic opposition remains that between one and more than one. The second pair of terms, homophonic/heterophonic is qualitative and applies only to ensembles, that is, to polyphony. These terms are not in a simple binary opposition but rather describe relative positions on a continuum between similar and differentiated voices or lines. When the face value of this ensemble of terms is recovered as I describe here, their application to real, existing music becomes much more subtle, and, I believe, interesting. With, for example, musical ensembles that practice the simultaneous variation of a single melodic idea, a practice common throughout much of the world, an analyst is required to apply the pairs of terms in different ways within almost every musical parameter. The use of a single, core melody is, indeed, a symptom of homophony, but local details — in the form of simultaneous variations and ornaments — exhibit a tendency to differentiation, i.e. heterophony. The question of the number of lines active in the ensemble becomes one of perspective: how closely does one examine the music? From a certain distance, that of the Schenkerian Urlinie or the Javanese Lagu, it may well sound like one line, but from other distances, an adequate quantification demands a number greater than one. If it sounds like I'm praising these terms for their precision only then, in their application to real, existing music, to let that precision slip away, like sand between fingers, it's because that's precisely what I want to be doing. Terms like these are useful not only because they make some features of music more clear, but also because they restore some of the mystery of music, by underlining aspects of the musical experience which are anything but clear. If you have any doubt how central the act of making the familiar strange again is to the aesthetic experience then just try, for a moment, to remember the face of the loved one you know best. I guarantee that the more you try to reproduce that face in your memory, the less satisfied you will be with the quality of your memory. You can know and treasure all the broad features as well as a wealth of details from that familiar face, but you can never recover all of the texture of that face, in its unique ensemble complexity. And the proof of this is that each time you see that face again, you experience simultaneously the delight of recognition and the surprise of the unfamiliar, a most musical condition. Today, while editing a score and in-between ferrying children and 'celli about, making borscht, cycling to the bakery & who knows what else, I listened to a series of recordings by David Antin (online here). Antin is a poet, critic, and all-round thinker, who does his best work standing up and talking, with a unique virtuosity. The themes of his talks, which may more immediately be dealing with poetry or visual art, are never really far away from concerns which I identify not only as musical but as vital to music. (I recommend especially the St Mark's talk on "line music counterpoint disjunction and the measure of mind"). Antin was a professor of visual arts at UC San Diego, and I once met him there. When I was in my last year of high school, I was torn between studing music and political science. I opted for music. My family couldn't afford any of the private schools I had been accepted into and so I was set to go to UC San Diego, then as now famous for its music department's focus on new music. I decided to visit the campus, but when I came to the music department office, I was told that the faculty did not speak to prospective undergrads and that it would not be possible for me to visit a class. Discouraged, I quickly had my acceptance to San Diego re-routed to Santa Cruz, which turned out to have been a very good thing. Four years later, I was finishing my undegraduate degree and I was looking for a grad school. Again I went down to UC San Diego, then as now famous for its focus on new music, to interview. Perhaps it was a bad moment, or maybe there had been some bureaucratic error but although I had scheduled the interview months in advance, no one was there to interview me. In fact, no one seemed to be around the music department at all except the secretaries and a few undergrads with that glaze that undergraduate musicians get when going into or out of a practice room. One of the secretaries was kind enough to let me know that I had already been admitted, but it was hardly an encouraging experience, and my other options looked more attractive. So I wandered around the campus a bit, and ended up in the visual arts department. Actually, Nan Rosenthal, an art history professor at my school, who had helped me in designing a course in experimental music, had suggested that I look into the visual arts department where she thought that the theorists there might be actually more relevant to the project of studying experimental music project than anyone in the music department would be. So I wandered about, and a gentleman with a look you'll never forget and an accent that was not of Californian origin noticed my wandering and invited me into his office for a chat. For the next three-quarters of an hour, I was completed engaged and, in turns, entertained, challenged and educated by Mr Antin, a private audience with someone who had the verbal skills of a great comedian, the rigor of a logician, and who appeared to know everything. Classical Greek, check. John Cage, check. Kaiser Fraser cars, check. I was left with the sinking feeling that, if an art professor knew so much about my area, about experimental music, then I had no business pretending to be an art student. Some years later, while writing my dissertation for the university, not UC San Diego, where I went to grad school, I took a year off and spent time in San Diego. I never managed to run into Prof. Antin again, but I did make an important contact with the composer Morton Feldman, who was then visting San Diego. My impression was that Feldman, who was looking rather fit at the time, had a nice routine: He would fly in to San Diego, hold forth in a seminar for grad students, and then drive down to the Hotel de Coronado for a late lunch before flying out of there in the evening. Since then, the discursive styles of Antin and Feldman, both virtuoso talkers, occupy nearby quarters in my private theatre of memory. It appears (see here) that there has been a last-minute application for the leadership of the Wagner Festival in Bayreuth by Richard Wagner's great-grandaughter, Nike Wagner (daughter of Wieland Wagner, a dramaturg, author, and successful director of the Wiemar festival, Pèlerinages) together with Gérard Mortier (presently completing his term at the Opéra National de Paris, set to begin in 2009 at the Metropolitan New York City Opera and well-known for his time as director of the Salzburg Festival). Nike Wagner has also indicated that in the case of a successful application, she intends to reach out to her cousin, the manager and director Eva Wagner-Pasquier (daughter of Wolfgang Wagner, the departing Festival director, who co-directed the Festspiel with brother Wieland Wagner until his Wieland Wagner's death in 1966). The new application is a response to the application of Eva Wagner-Pasquier with her half sister Katharina Wagner (who has begun a career in opera stage direction) earlier this year. That application was something of a surprise, as it required a rather sudden reconciliation between the semi-siblings who had previously been divided both personally and professionally, as members of "opposing teams" in the succession question. Eva Wagner-Pasquier had previously applied together with Nike Wagner, and Katharina, who had initially been viewed as a stand-in for her mother (who passed away suddenly in December), had made a serious application together with the conductor Christian Thielemann, a specialist in late German romantic repertoire. The Frankfurter Allgemeine Zeitung is on a real roll with their Bayreuth reporting. It had a hard-hitting article on Sunday which focused on the financial aspects, and was especially critical of the position of Katharina Wagner, who has a 30 percent share of a private commericial entity which had rights to certain income associated with Festival "products", yet does not contribute to the financing of a festival which receives a large state-subsidy and is regularly bailed out by the Society of the Friends of Bayreuth. The lack of transparency over ticket distribution (an interesting topic which could fill another post) and the price structure of the tickets received criticism as well; given the receipt of state subsidies, these are non-trivial questions. I've mentioned Stearns here before; he just might be the most honest Ivesian of us all. "We wanted to be able to control amplitude and frequency, etc. I used the Boulez, Le marteau san maitre [1953-55], first page as an example. I would imagine patching the Boulez and see something was missing and we would add another knob." The book is also quite touching at times, for example in Pauline Olivero's appreciation of her teacher, Robert Erickson, and in Subotnick's tender memories of his, Darius Milhaud; I believe that it is very important to this narrative that the teachers who appear to have been most critical were, to a certain extent, outsiders in the local academic music scene, and not the emerging stars like Berio, Imbrie, or Shifrin. (The name of William Denny might well be added to this group of mentors). The text has reinforced my sense that the group of composers around the Tape Music Center (as well as a number of younger colleagues around the Bay) shared and developed a set of common elements, which I have previously identified as a radical aesthetic, and the better-known minimal (and minimalist and minimalistic etc.) music which would later be identified on the other coast grew largely out of this. — multi-media and new forms of musical theatre tending toward the sensibility — one might today say wholistic — that musical performance existed within a larger field of performance, including performances like the "Trips Festival" which were well outside the realm of traditional concerts and clearcut audience/performer distinctions. While there are a number of details which are unique to the San Francisco project — the dislike for splicing, for example, which would lead, on the one hand, to tape looping and delay techniques, and on the other to the development of the modular synthesizer as well as the unique intensity of the Bay area cultural scene in that era — I think that identifying these aesthetic elements places the San Francisco Tape Music Center (alongside the Project for Magnetic Tape in New York and the Cooperative Studio in Ann Arbor) more in the mainstream of the subsequent developments than that of the now largely forgotten work done in the institutions to which the Center was an alternative. An afternoon's postscript: I should have written something about the issue of control here. In contrast to, say, the work in the Columbia-Princeton studio, in which the studio (and the RCA Synthesizer in particular) was seen as a tool for the obtaining greater control over the production of sounds*, the musicians in the San Francisco studio exploited the enormous potential of the technology to create environments in which the composer or player often had less rather than more control. The preference for live delay over splicing and editing and the use, in the Buchla instruments, of modules specifically designed to introduce unpredictable elements are both examples of techniques which imply the acceptance of results beyond the composer's immediate intentions. Open acceptance of such risks also illustrates the general sympathy felt by the Bay area radicals for Cage's works involving indeterminacy and chance operations, but must also be recognized for its relationship to improvisation, for which Cage personally, at least at that point in time, had little interest. The issue of control was, of course, central to the independent and cooperative structure of the studio as a formal organization, and that was another strong point of contrast to the Columbia-Princeton as well as the European studios founded in State-owned radio stations. I also should have something more about the accompanying DVD: It's great. Basta. * (A day later's footnote to the postscript:) Has anyone else noted the somewhat ironic situation that now, with the present digital technology, rendering scores in which all parameters are closely controlled — as in a number of high serial/twelve-tone works — into precisely realized sound files is such an easy task (12 different dynamic levels? no problem! ), that it's no longer an interesting thing to do? Recently, to warm up a bit on a new version of a notation program, I entered the score to one of those classic 1950's serial-bebopperies. All of that famous detail and complexity was not only visibly but audibly present: wild pitch constellations, complex rhythms, individual dynamic levels and articulations on every note played accurately, with discrete levels, and completely vivid. But it also felt — and here's an odd combination — both facile and mannered; it's like visiting your elderly Aunt in Morro Bay who, for dessert, serves a pineapple upside-down cake that looks exactly like a photo of a pineapple upside-down cakes from a 1957 issue of Sunset magazine. Fashions do change. I wonder how many famous composers have been captured performing in theatrical films? Darius Milhaud, Georges Auric and Erik Satie appear in Entr'acte (1924, 22 min. Black & White), the film insert in the Satie/Massine/Cocteau/Picasso Ballet Parade, Milhaud again appears, this time along with Paul Hindemith, in Hans Richter's Vormittagsspuk (Ghosts Before Breakfast) (1928, 6 min. Black & White), Oscar Levant — whose serious compositions seem to have disappeared — had a regular career on the Hollywood screen, and there is also John Cage's shirtless stroll through a field in Maya Deren's At Land (1944, 15 min. Black & White). But perhaps the most significant film appearance by a composer is that of Alvin Lucier who, in addition to appearing as Prof. Alvin Lucier, a role based in part on himself, in Nam June Paik's A Tribute to John Cage, (1973, 29 min. Color) had a starring, title role in George Manupelli's trilogy of full-length Dr. Chicago films: DR. CHICAGO (1968 118 min. Black & White), RIDE DR. CHICAGO RIDE (1970 109 min. Black & White) and CRY DR. CHICAGO (1971 96 min. Color). In the series, Lucier plays Dr. Alvin Chicago, an outlaw surgeon on the lam with a, shall we say, gift for seriously incorrect and punning wordplay, accompanied by his sidekicks Sheila Marie (Mary Ashley) and Steve (Steve Paxton), the latter of whom is mute and dies, dancingly, in each episode. It's hard to choose a favorite part of the trilogy, but for me it's either one of Dr. Chicago's monologues — reciting The Raven or the MLK, Jr. I Have a Dream speech, or the sequence in RIDE DR. CHICAGO RIDE in which the good doctor separates the counter-villain's (Pauline Oliveros) conjoined twin daughters (played by the multi-cultural musical virtuosi Betty and Shirley Wong). Director Manupelli may already be familiar to some readers of this blog for his short advertisement for the San Francisco Art Institute, with Don Novello as Father Guido Sarducci, Become An Artist (see here) and others may recognize his name in connection with the legendary ONCE Festival and Group of Ann Arbor, MI. You can see some stills and — better yet — order your own copy of the complete trilogy DVD collector's edition here. ...composition is only a very small thing, taken as a part of music as a whole, and it really shouldn't be separated from music making in general. This is an important document about a seriously overlooked composer, an interview with Douglas Leedy by Valerie Samson, 1974. From EAR (the original, west coast EAR, of course), vol.4 no. 4, April 1976. While the discussion is decidedly of its historical moment, it is astonishing how current the themes remain. Leedy discusses a number of topics central to the west coast radical music: the turn to world musics, the re-examination of musical time that would be central to the music tradition later identified as minimal, the increasing focus on musical intonation, studying composition alongside La Monte Young and Terry Riley, the problems of musical training — both the advantages of voluntarily entering a master-student relationship and the "the problems of being up against people whose thinking had completely petrified" —, the real reason why one should not care about audiences, and more about the west coast musical environment. With certain exceptions (those sold in large editions -- educational scores for ensembles, piano albums for domestic use, and, more recently, music-minus-one-style packages) publishers do not make money from the sale of scores and sheet music. In fact, for contemporary art music, the sheet music is a net loss business, and many publishers have actually turned to billing their own composers for the costs of editing and producing scores and parts, leaving many composers in a net negative balance with their publishers against which further score sales and performance licenses are debited. Publishers, with repertoire like contemporary music, make money from licenses for performances, recordings, and broadcasts and, to some extent, from the rental of score-&-part sets. As far as a contemporary composer is concerned, the function of a publisher, should a composer choose to work with a publisher and not do it on her/his own, is to promote the work and manage the performance materials, making certain that they are in good order and in the hand of performers in a timely manner. For these services, a publisher receives 1/2 of the composer's licensing fees from the responsible rights organization (ASCAP, BMI, GEMA, etc.). The primary function of score distribution today is promotion, as perusal materials to encourage performances, recordings, and broadcasts, with the sale of scores for private use, study, or archival purposes a distant secondary function. Licenses are collected from performances, recordings and broadcasts regardless of whether the performance materials are purchased, rented, stolen, or even non-existant (e.g. most cover bands don't need scores and parts). From a rational point of view, the fastest and most efficient way to get scores into the hands of prospective players and program directors is electronic and any publisher who doesn't allow such distribution is failing to promote their artists adequately, making the argument for the 50% take of licenses hardly sustainable. The optimal relationship between a publisher and a composer is one in which a publisher recognizes an interesting composer and makes an investment in the composer's present and future work, speculating both that the composer will continue to create music of interest to players and managers and that the publisher be able to successfully place that work onto concert programs, recordings, and broadcasts, with the return on investment to come from the half-share of licenses and, perhaps, rental of parts. Arrangements in which a publisher is essentially acting as a vanity press for the composer — i.e. producing a beautiful score at the artist's expense and not further promoting the work — are to be avoided. The advice I always give colleagues is this: don't enter into a relationship with a publisher unless (a) you are unwilling or unable to do the work yourself, (b) the contract stipulates precisely which editorial and promotional services the publisher will provide, with no costs to the artist beyond the assignment of the publisher's share of license fees, (c) the contract allows for the free distribution of perusal scores, preferably by electronic means, as a means of promotion, and (d) there is a mechanism for the artist to end the contract in case the publisher fails to provide the services agreed upon. Finally, since you have interest in an academic as well as a compositional career, you may well come under some pressure to have your work published by a traditional music publisher. If you decide to go this route, fine, but it is also very important to help make it clear to your institution that sheet music publication is not the equivalent of peer-reviewed academic publication. The essential form of publication for a composer is in the form of performances, recordings and broadcasts and if a sheet music publishing arrangement doesn't lead to (or actually leads to fewer) performances, recordings or broadcasts, then avoid it. One of the first tricks many of us tried in an electronic music studio was recording something — preferably with a text — then reversing it, learning to perform the retrograde version, recording that, and finally reversing the retrograde recording so that you end up with something that has a clear resemblance to the original (forward) recording, but remade into something strange and disorienting. This is a species of variation made from accumulated errors in the transmission of information, but the errors here have a special character due to the fact that our perception of sounds is largely non-symmetrical with regard to time. (The same technique is used by some filmmakers, including Lynch and Scorsese, to disconcerting effect). John Cage, in describing his own early Sonata for solo clarinet, a piece based on strict palindromes in both pitch and rhythm, criticized his own use of symmetry in the work as "indicat(ing) the absence of an idea". Indeed the presence of a symmetrical rhythm can often lead to precisely the same sort of leveling recently discussed on this page. Messiaen's term for palindromic sequences of rhythmic values (which, to be honest, has always struck me as an awkward formulation) was non-retrogradable rhythm. What does a non-retrogradable rhythm accomplish? Either it is a instance with no real musical value, a transformation of a sequence of musical events with a net change of zero, i.e. an identity operation, within the rhythmic domain, or it is a transformation that somehow depends upon our non-symmetrical perception of time. If we have a sequence of eighth-quarter-quarter-eighth, in real performance, each note value is going to be quite distinct as each note is heard in a unique context, but taking it as a retrograde implies an erasure of any such distinction. To recover the distinction, the symmetry thus has to be violated in some way. Morton Feldman, in his extraordinary essay (and in a series of works beginning a piece of the same title), Crippled Symmetry, calls attention to simple but rich techniques in which a symmetrical pattern is broken, for example by using a pitch sequence which is non-symmetrical to "color" (to use the medieval term) a symmetrical rhythm. Why are such techniques so effective? Or: What, precisely, is the utility of a symmetry if it is projected on a musical surface by materials that contradict that symmetry? Now with a small deck, the process is brief and rather transparent, but with ever larger decks, the process gets more interesting, and as it goes through each shuffle, the original sequence — in my usage, it's usually a tune of some sort — is, in effect, comb filtered and laid over itself so that one hears a shadow of the original melody which has been halved in two different ways — split down the middle and slowed to half the tempo. 1. Robert Gable announces a new online mix of audio tracks with the title the american minimalists. Mr. Gable notes that he avoided a number of tracks "due to reasons of length and/or extremism". 2. The poet Ron Silliman announces the publication of a poem of ca. 1000 pages, The Alphabet, a work composed over a period of 29 years. He goes on to announce that "Now it’s time to turn my attention to trying a long poem, Universe." 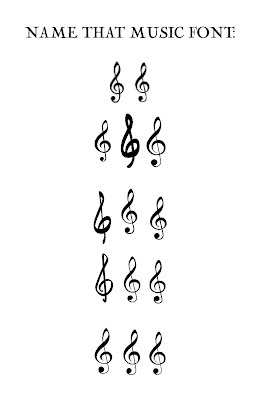 Identify the treble clefs (above, in a random order, click to enlarge) from 14 different music fonts. These are, in alphabetical order, Engraver, Feta, Fughetta, Helsinki, Inkpen, Jazz, Maestro, Opus, Petrucci, Reprise, Sonata, STocatta, Tufa, Turandot. A small advertisement for my own music: I've just got round to assembling a complete PDF file of my 12 KLEINE PRÆLUDIEN (2006) a compositional project somewhat associated with my new music blogging. This collection of 12 pieces — with two alternatives as circumstances require — is intended, cheerfully, for domestic music making. The collection may be played in whole or in parts, and if played in whole, I prefer the printed circle of fifths order, beginning with Ab and ending with C#. The premise here is the notion that a prelude is a cadence elevated to a minor epiphany. Feel free to download it here. John McCain can't seem to find many musicians willing to let their tunes accompany his campaign. Newsweek has the story here. While writing a piece for four instruments (Neglected Topiary is the provisional title: any objections? ), I noticed that I keep coming 'round to a relatively equal distribution of labor between the instruments, even though the instruments themselves are decidedly unequal by a number of measures. Without exactly planning to do so I ended up, for example, with each of the 15 sections of the piece assigned to one of the 15 possible combinations of the four instruments. This egalitarian default setting is, I suppose, a habit from the mid-to-late 20th century, in which, through whichever determinative strategy, distributions of pitches, registers, instruments, icti, dynamics etc. tend to be flat rather than biased. Now, in the second-go-round* at the score, I've started introducing processes for upsetting this balance: erasing here, adding there, chopping up something, overlapping or interrupting this with that. It's beginning to turn into something more like music. Even more unsolicited advice to young composers: if you use a computer engraving program, don't use the default text fonts. Use of the out-of-the-box settings may be taken as a signal the composer is unengaged with the appearance of the score and those New Roman Times are very 1995, if you get my drift. Why not try, instead, to use fonts that visually complement the sensibilities of your music? If you have the skills, make — or have made for you — your own fonts, ideally for both text and notation. Composer-novelist-all-round talent Carter Scholz made a suite of text fonts based on calligraphic designs of Lou Harrison (they're available from Frog Peak Music). A font based on John Cage's best text calligraphy has been available for some time, as well (it's here; I believe, however, that some of the glyphs in the "extras" set are actually from drawings from Thoreau's Journal that were used by Cage in works). 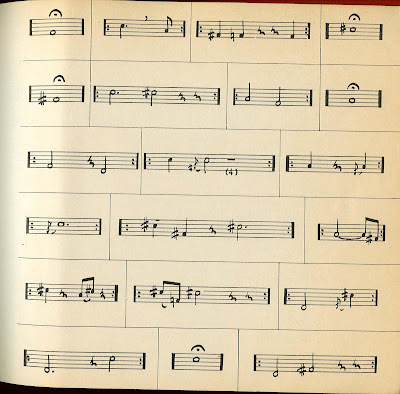 The scores of Karlheinz Stockhausen, from his own home-based publishing house, use both music and text fonts designed, to Stockhausen's specifications with the text based upon his own handwriting, by James Ingram. I believe that the Stockhausen Verlag uses Optima as its house titling font, another part of the distinctive look. In my own scores, I'm slowly getting closer to a satisfactory default engraving style. For some time, I've had a font for titles which I like a lot (Cochin Archaic) and I've come round so far to the principle of distinguishing markings within the stave systems (lyrics, tempi, expressions, various devices; all items that require player interpretation) with a serif font from text external to the stave systems (information and instructions that are given rather than interpretable: names of instruments, measure numbers, clocktimings, the word "score", the copyright line) which is done sans serif. I will admit that, up to now, I've put these in out-of-the-box New Times Roman and Arial fonts, as placeholders for my dream fonts, but am finally settling on a pair of alternatives with which I will retrofit all of my scores. One of my next big projects will be tweaking my music notation fonts to get a set of symbols which are somewhat closer to my own manuscript style, but fonts are tricky to make and there's a lot of learning to be done before I get there. Websites remain, however, the one ubiquitous media in which a choice of fonts is seriously limited. You might really want to have say, Palatino, but not everyone has a Palatino on their machine, so the CSS or HTML code will include a list of acceptable fonts in order of preference (for example: Palatino, Garamond, Georgia, "Times New Roman", Times, serif, to steal from the style sheet of a prominent young composer-blogger). If you really want a particular font, you have to place the text in question in a graphic of some sort, and that can mean some bandwidth costs. Also this: anyone else seen Gary Hustwit's documentary film Helvetica? My least favorite typeface — that tail on the "R" really does it in for me — but still a film to watch. The money quote comes from designer David Carson: "Don't confuse legibility with communication". More than a few composers — from Ligeti's Kylwiria to Kraig Grady's Anaphoria — have invested formative time, whether in childhood or as adults, in the invention of imaginary lands. Once one starts imagining a land, all of the details start to emerge: maps, languages and writing systems, mythology and literature, customs and rituals, postage stamps and passports, poetry and music. These newfound countries tend to be more systematic, more orderly, than any real, existing messy and conflict-prone places, which shouldn't be much of a surprise, as these are often refuges from bright and creative people who don't quite fit into the world as it is, and imagining utopia is certainly one of the functions that artists and writers and composers can often perform superbly well. ... author, whether the Ur-situationist Lefebvre or Charles Olson writing in his most telegraphic critical mode, saw their work, these specific books, as making contributions to practice(s) whose hoped-for fruition existed principally away from the university, whether writing in writing poetry or making a political revolution. They are not contributions to a professional debate. Professional music "theory", as practiced in universities and conservatories, is largely an account of practice in music already made, recipes for synthesizing new music that is similar to old models, or suggestions for the interpretation of existing music through the articulation or projection of particular features, but speculative music theory is the domain of composers, the work done in preparation for and during the composition. A speculative theory inevitably has the same utopian qualities that the grand theories Silliman discusses and many composers spend their creative lives, in effect, building imaginary worlds that follow their own sense and logic, accumulate their own habits and histories, and, as they grow, undergo all the successes and failures, consistencies and contradictions, tragedies, comedies, and farces that real lands experience. You create music to put it into the world, but it inevitably lives two lives, one in that real world, cruel or kind as it may be, the other, private, and cruel or kind as your own imagination. I recently received a number of requests to join a social networking site specializing in new music; I joined up, and promptly started receiving requests to become "friends" with other site members. I don't know if it's more a function of age or of personality, but I realized soon that this was definitely not my environment, and terminated my membership after about half an hour. I've been online, in one way or another, since using BBs with a 300-bit acoustic modem hooked to an Atari ST, moving onto various online groups and mailing lists, eventually putting up a website of my own, and then this blog (which will soon turn 1000 posts and four years -- that'd be about 80 in blog years, I reckon). But social networking sites seem to be the station where I have to get off the train. The music site I mentioned is an independent affair made by people of abundant good will, but the major sites are in the hands of genuinely evil entrepreneurs. The format of these sites tends to be quite rigid -- a few variations around a small set of templates -- and the intention seems to be to manage information down to smaller digestable bits rather then to offer more. The status of intellectual property put on these sites is often problematic. And the central feature of any given page on one of these sites seems less to be information about the individual member, and in the case of musicians, since promotion is a central concern, his or her creative work, but rather the set of passport-sized photos linking to the pages of "friends" in the network. Although I will be the first to admit to having a difficult personality (in grade school, I never got better than a C in "gets along well with others") and my insistance on the value of independence is well known, I do treasure friendships and no labor is a greater gift for me than the cultivation of friendships. For that reason, I can't honestly bring myself to use the word "friend" to point, on a public website, to a node in an online network. My own music lives in the world, to the degree that it does, due to real networks of relationships, both personal and professional, but these networks are so very complex and so sensitive to countless variables and conditions and vary in so many qualities and amplitudes that the reduction of any relationship to a blanket word "friend" robs both the relationship and the word of something valuable. The delivery system for new music and information about new music is in constant and ever more rapid change and changes in the very nearest future are sure to surprise us. It's not hard to imagine that technocrats at ASCAP or GEMA are just now figuring out how to collect licenses for the music used by avatars in virtual bars and concert halls on virtual reality sites. Social networking sites may well become — if they aren't already — important vehicles in this system, and taking some distance from them could eventually be costly for me and my music, but what else am I to do? Okay, I'm game for controversy: Geoffrey Wheatcroft of The Guardian argues (here) that the best musical of the 1957 Broadway season was Meredith Willson's The Music Man rather than West Side Story. I'm about as far from a Broadway musical fan as anyone, but I have to agree with Wheatcroft on this. Willson, a graduate of Damrosch's Institute of Musical Art (later The Juilliard School), was a flute player in both Sousa's band and the New York Philharmonic under Toscanini, was a composer capable of some real subtlety that gets overlooked, perhaps as the corn in his subject matter is perpetually less fashionable than the kitsch in the work of his competitors. This1972 interview with sculptor De Maria — whose Lightning Field is perhaps the most impressive single work of art I know — is further evidence of the origins of the practices that came to be known as minimalism in the west coast radical arts scene of the late 1950s and early 1960s. There are some unfortunate errors in the transcript (of names, especially: La Monte Young, Marian Zazeela, Loren Rush), but it's nevertheless a valuable document. WDM: But Lamont's (sic) static music and Whitman's touch, it was really fine. Lamont is only now coming out with records, only now coming out with the second record. Lamont has influenced Terry Riley who has made beautiful records. Terry Riley influenced Steve Reich who has made these records for Columbia and Phil Glass evidently discovered a similar type of music independently. So now they have what they call a Hynoptic School of music. Very static, long long tones without great variations from measure to measure, more like a solid state or a solid feeling. Rather than having great variations in pitch and variations of melody, you carry on solid . . . .
WDM: Yeah, almost like the drone is the basis of it. Lamont developed that and I played a certain part in it, making certain tapes like in '64, and Terry Riley developed it in his way using the tape delay, where you play a certain thing and then three seconds later it plays again and then it echoes again and the beautiful N C and Rainbow occurred on Columbia Records. I was very close to Terry and I nearly formed a band with Terry and John Cale. We were playing right in the other part of the studio, had all of the material set up. We were trying, but Terry had his idea, John Cale has his, I had mine. To make a band you have to work out your common feelings and ideas, and it's just too much. ...doing my service in the complexity wars, for example at this rambling elsewhere. ...giving a counterpoint lesson yesterday, and in response to some questions about parallel fifths, hockets, and voicings wrote this little exercise (PDF , four minutes or so for brass quintet (Why brass quintet? I selected the template in Finale by accident and was too lazy to bother switching). ...reading some, too. The Art of Memory is a blog dedicated to minimalism wrote larger, it's elsewhere, too. The absence of vibrato might, in some cases, indicate an aesthetic preference, in others, laziness or even a lack of training. The presence of vibrato, on the other hand, might indicate a different aesthetic preference, as well as laziness (vibrato, can, of course, cover up lazy intonation) and/or lack of training. The central issue with regard to vibrato ought, however, be control: over the depth, speed, contour and placement of vibrato as a valuable ornament. From this viewpoint, the constant application or the constant absence of vibrato — when not specifically demanded in the score** — is often a sign of lack of control, if not plain error. That said, given the over-use of vibrato up through most of the 20th century, the historically informed players who have attempted vibrato-free performances have presented a welcome corrective and I believe that a more balanced approach to the application of vibrato will come when the point of departure is a vibrato-setting of zero rather than one of eleven. * During my Hungarian years, I often heard orchestras of Roma musicians among whose members there appeared a deep competition to produced the widest and fastest vibrato, and when not that, the vibrato at most wildly variant from the rest of the ensemble (these were orchestras, after all, entirely composed of musicians used to working otherwise only as soloists). Rather than dismissing this altogether, I came to the conviction that there was, in this performance style, some legitimate traces of historical high-brow practice, both good, bad, and indifferent. ** In, for example, John Cage's String Quartet in Four Parts. John Cage used to demonstrate time brackets to skeptical audiences by conducting one unit of time with his outstretched arms, first one, then another, imitating the motion of a clockhand — the same conducting techique used in his Concert for Piano and Orchestra and Atlas Eclipticalis — during which time period a skeptical audience member was to make a sound, any single sound of their own choice. This apparently very simple exercise contained all the ingredients necessary to create a musical event which was itself anything but simple; in fact, all of the elements of musical time were in play for the composer, the skeptical performer from the audience, and the rest of the audience. First, the duration of the time unit described by the clock-like motion and the speed of the clock -- as it needn't go 'round the clock face at a constant rate -- were variables. 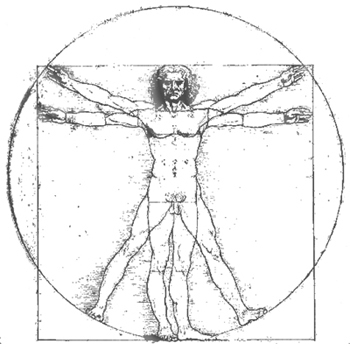 The beginning and completion of the cycle were markers within a larger context. Is the time "outside" of the cycle zero time? Does the completion of a cycle suggest imply its repetition? And the performance of the skeptic noisemaker introduced articulation that was inevitably musical: Did it coincide precisely with either the beginning or end of the cycle? Did it divide the cycle into some recognizable fraction? Did it occur slightly before or after either the termina or some rational division of the cycle? What about the duration of the sound? Did that duration relate — was it proportional — to the duration of the cycle as a whole? Did the sound contain internal subdivisions or subarticulations, further marking the cycle? Did the interaction of cycle and sound articulate or suggest a tempo or metre, perhaps -- when the sound even itself has subarticulations -- a polyphony of tempi or metre? Or even movement or rubato within that tempo or metre? And so on. The most striking thing to me about this exercise — which I witnessed Cage carry out three or four times with rather different audiences in rather different settings — was how musically robust it was, or rather, how temporally robust music might be. Even if the skeptic wanted to go beyond skepticism and sabotage the exercise in some way (which usually takes the form of a very loud sound coinciding precisely with either the beginning or end of the cycle), it was nearly impossible to ruin the exercise as there was, as far as I could or can imagine, no relationship between the cycle and the sound which was not — or at least potentially not — musically useful. Other composer and musicians look at this condition, this peculiar condition of musical time, as if peering into the abyss and ask How could music be any more arbitrary that this? And they draw the conclusion that music, if so arbitrary in possibilities, must be easy. I believe that this is a false conclusion, and that music is in fact extremely difficult precisely because of this huge vector space of possible states, for as potentially useful and rich in implications as each might be, this was an exercise, not yet composed and not yet music. In order to go beyond the arbitrary temporal world of the exercise, the event music be placed in a larger context, and that one supposes, is composition.